You guys are probably better parents than we are- you probably don’t hand over your cell phone/iPod/iPad to bribe your Smooches with Angry Birds. But we do. And so Burke has deep love and great enthusiasm for Angry Birds Rio (and Letter School… and Cut the Rope… I could go on, but I won’t). 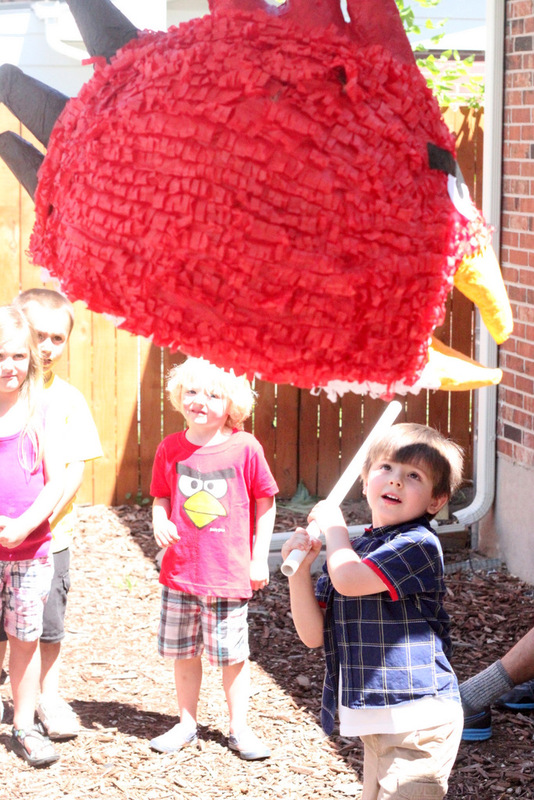 Of course, when I asked him what kind of birthday party he wanted this year, Angry Birds Rio was the immediate choice. 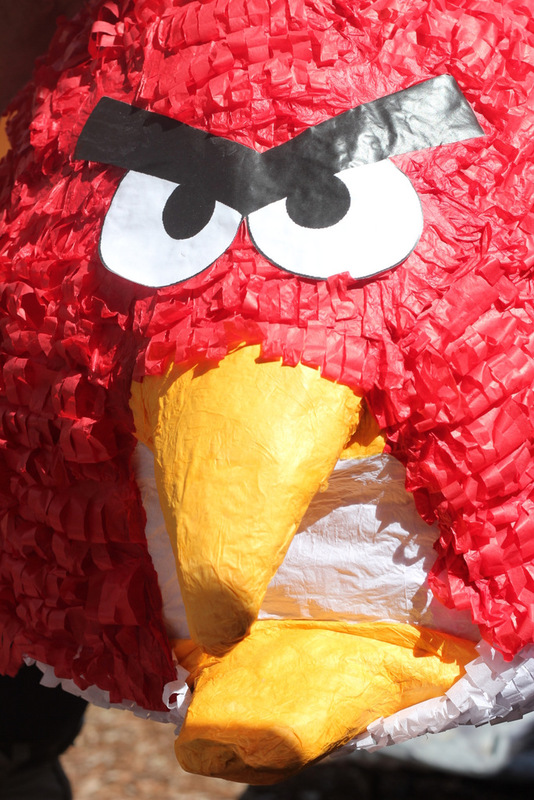 The lesson I learned putting this party together- you can make pretty much anything into an Angry Bird– just add eyes, a beak and angry eyebrows. 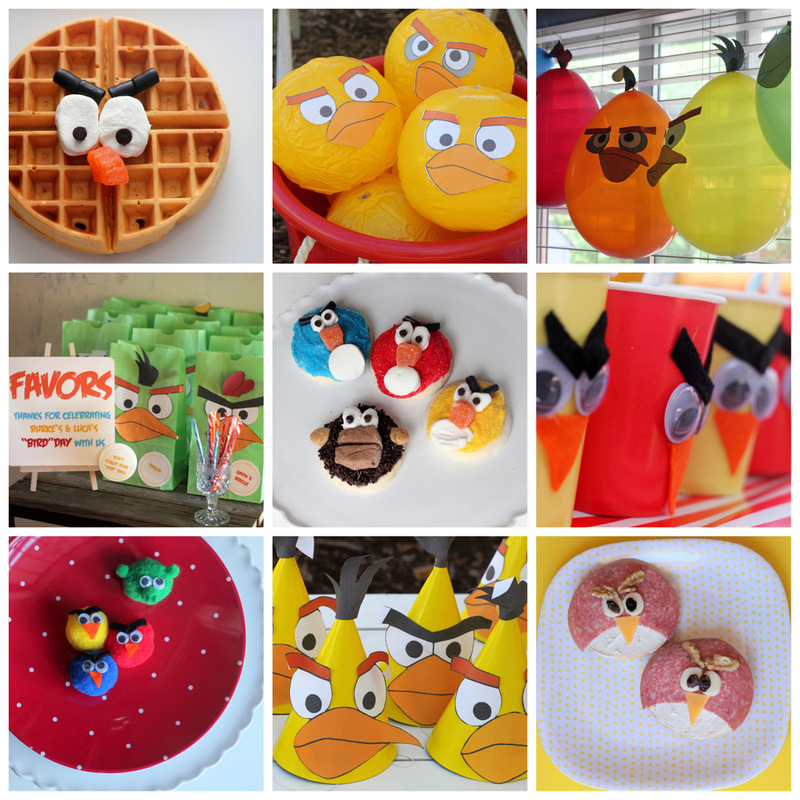 Balloons, party hats, beach balls, paper bags, bagels, cookies, waffles, paper cups, pom poms- they’re all just canvases waiting to become angry birds. Good to know right? 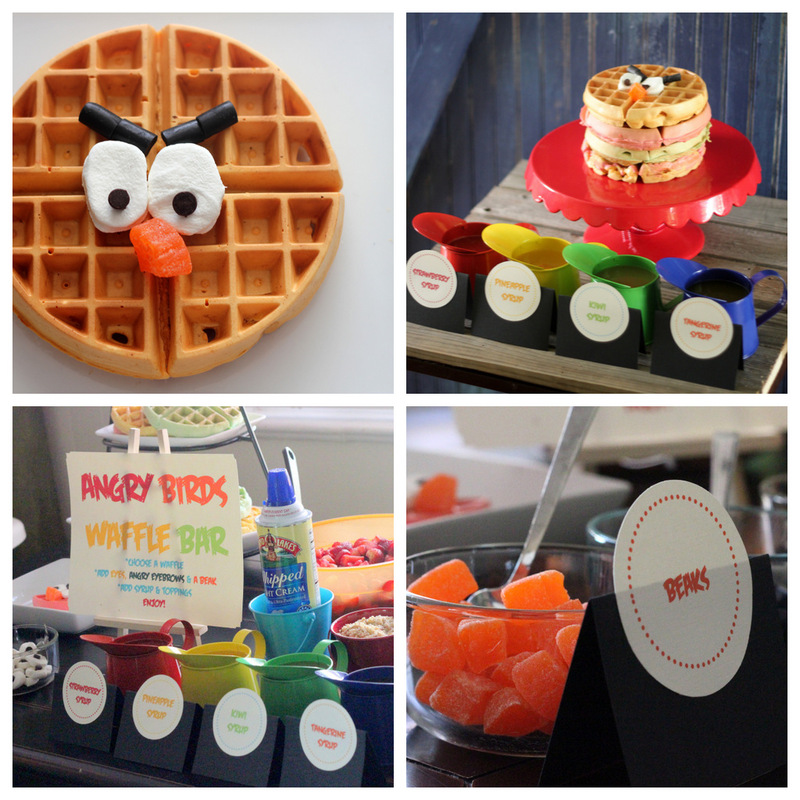 The fruit waffles with a whole selection of homemade fruit syrups were the hit of the party (well, actually, I think the “beaks” [candy orange slices], “eyes” [sliced jumbo marshmallows with chocolate chip eyeballs], and “angry eyebrows” [Twizzlers Nibs] were the real draw)! 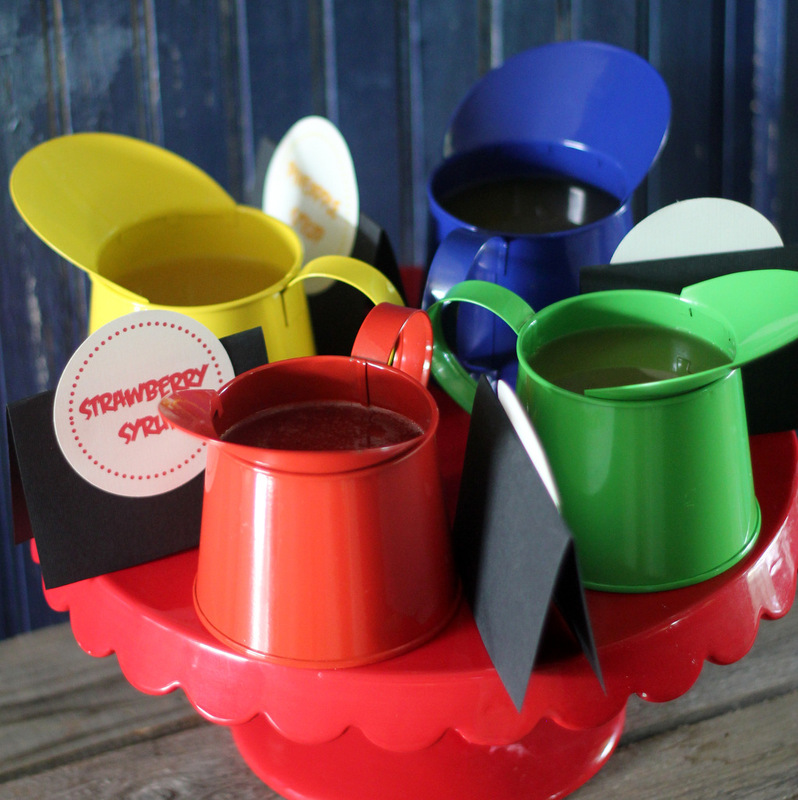 Burke and I spent an entire naptime last week making the Strawberry, Pineapple, Tangerine and Kiwi syrups- he declared the pineapple to be his favorite, but said that all of the others were “still pretty good.” The colorful watering cans were a Dollar Tree find. Since waffles piled high with tons of berries and whipped cream are pretty much my dream brunch food, I may or may not have hit up the waffle bar more than once. I’m pretty sure I wasn’t the only one, either. 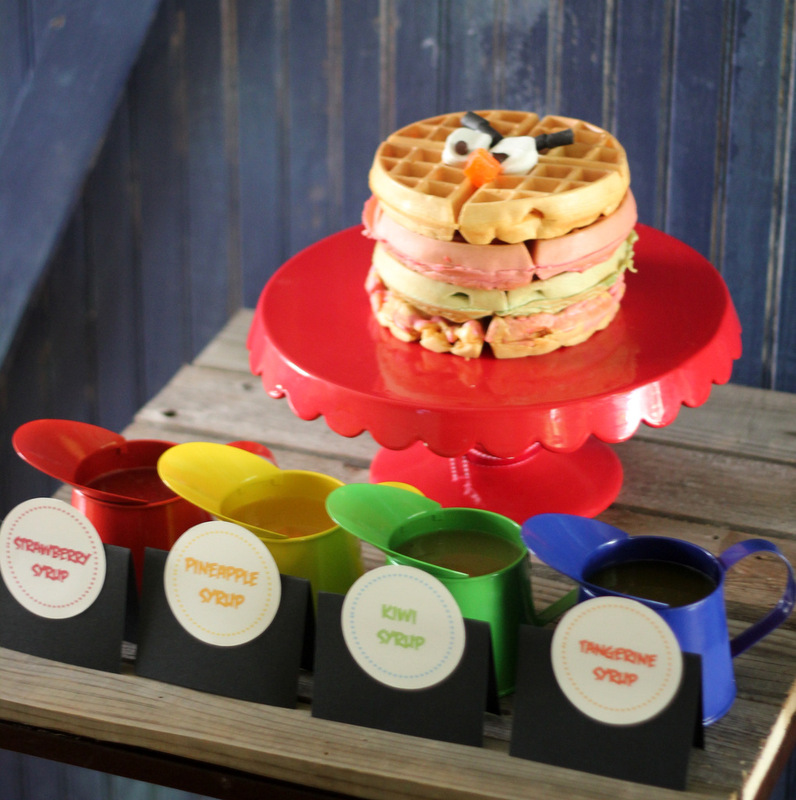 EDITED TO ADD *I’ll put together a post with the fruit waffle and fruit syrups recipes! 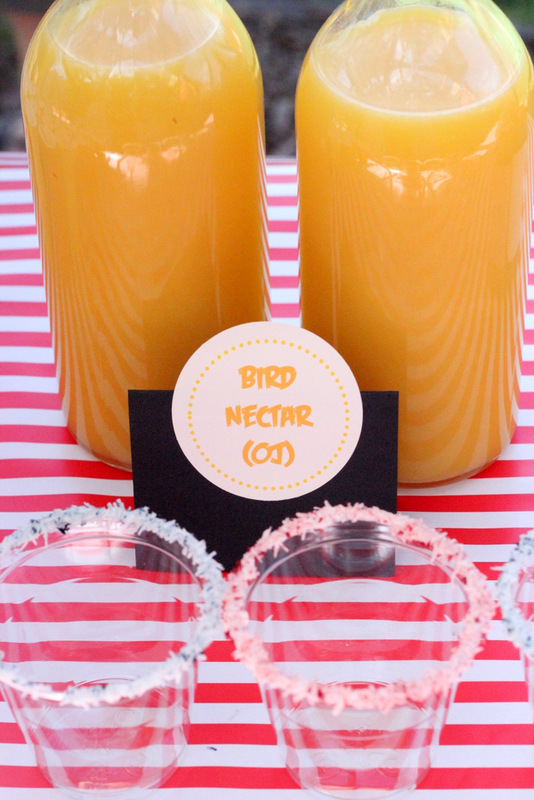 Even though the Angry Bird paper cups were a kid favorite, I have to admit that the ‘feather’ (tinted coconut) rimmed OJ glasses were one of my favorite parts of the Drink Table. 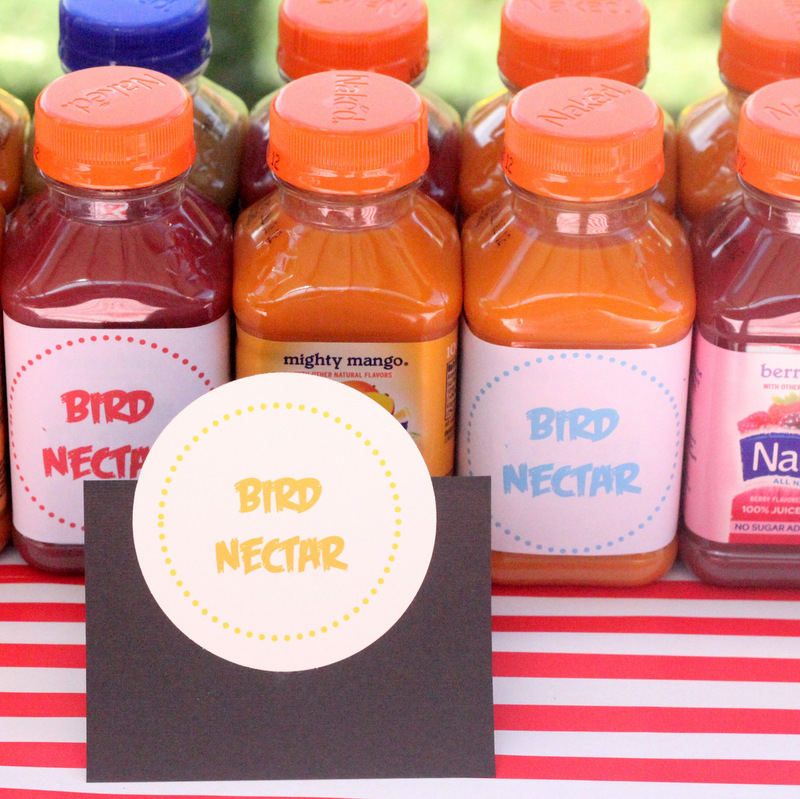 The single serving Naked Juices (covered in “Bird Nectar” bottle wraps) were also quite the drink table highlight. 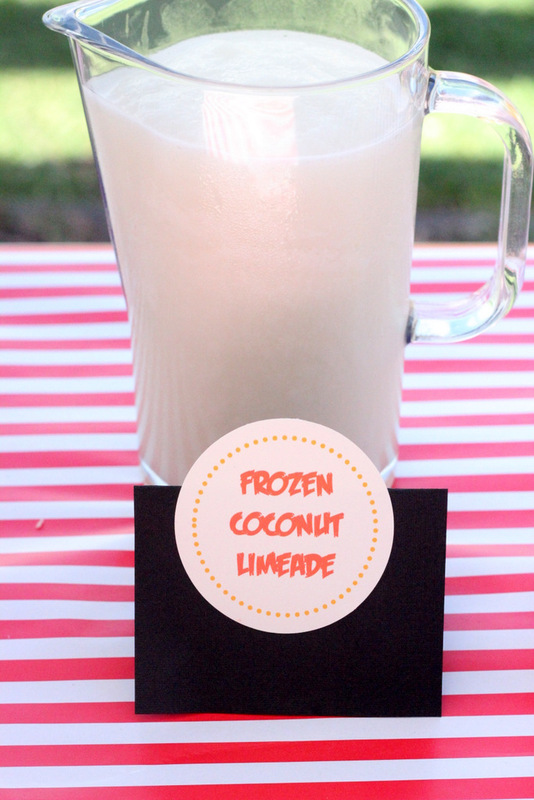 And don’t get me started on the Frozen Coconut Limeade (modified from this one at Chef in Training). Seriously- it was SO GOOD (details for both the “grown ups only” and “kid friendly” versions will be on the Sips blog soon). 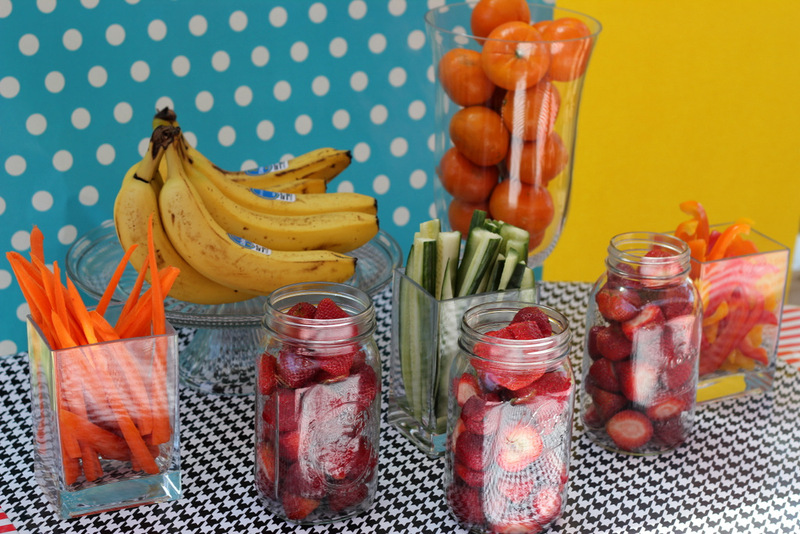 In an (unsuccessful) effort to minimize the sugar and carb heavy menu, we added a “Bird Food” fruit and veggie table to the mix. I think I might’ve been the primary frequenter of this table (haha! ), but it’ll definitely make an appearance at more parties in the future! 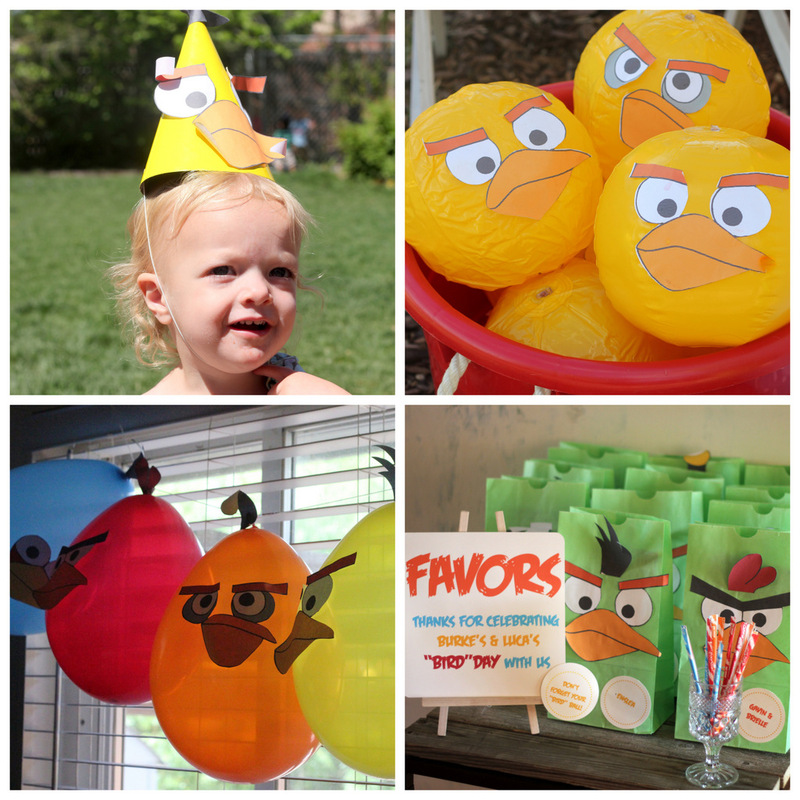 The Angry Birds faces that were plastered on the balloons, the hats, the favor bags and the beach balls were all using the free printables courtesy of The Party Animal. Love. 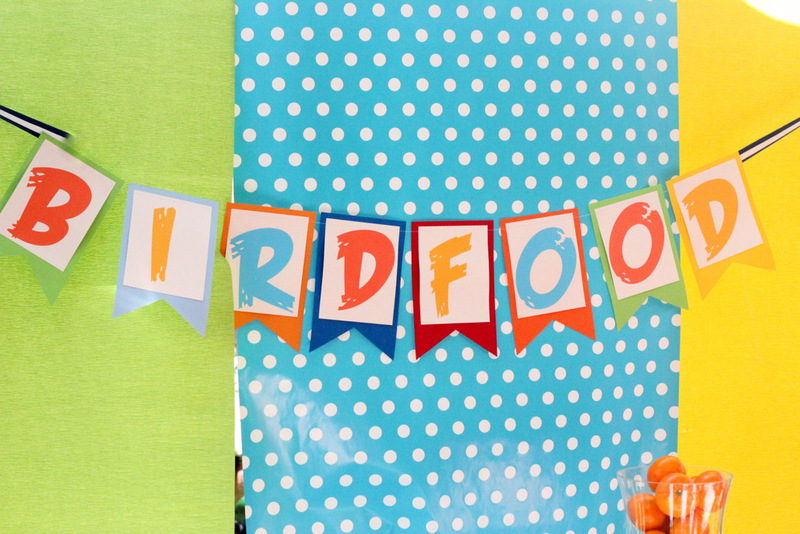 I made the “Bird Food” banner, the “Happy BIRDday” garland, the Angry Birds cupcake toppers, the food labels, the bottle wraps, the favor bag labels and the other party signage in Photoshop and Powerpoint (mostly Powerpoint). The guests hunted eggs (though, in Angry Birds Rio pineapples are the hunted-item… Burke didn’t seem to notice the discrepancy). And we carried on our World’s Biggest Pinata tradition (remember last year’s Hello Yellow Pinata?). The kids loved it! 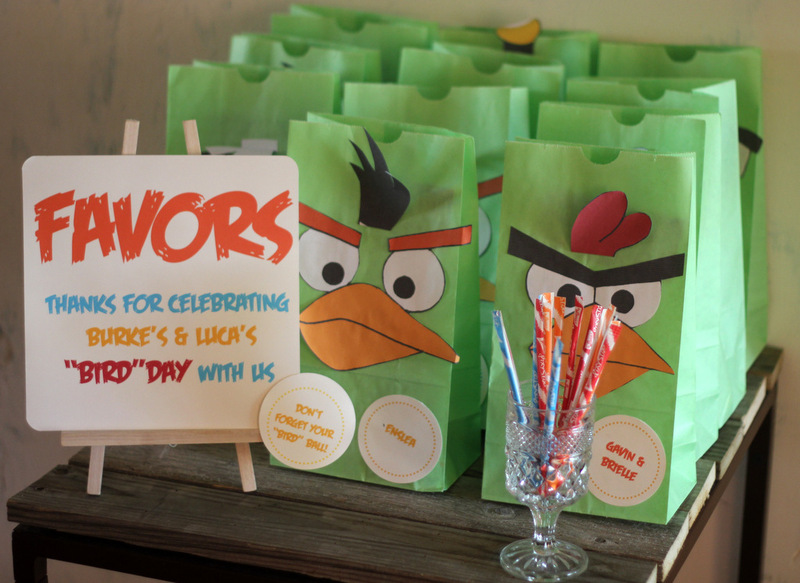 These goodie-bags-with-angry-bird-faces were full of Angry Bird goodness! 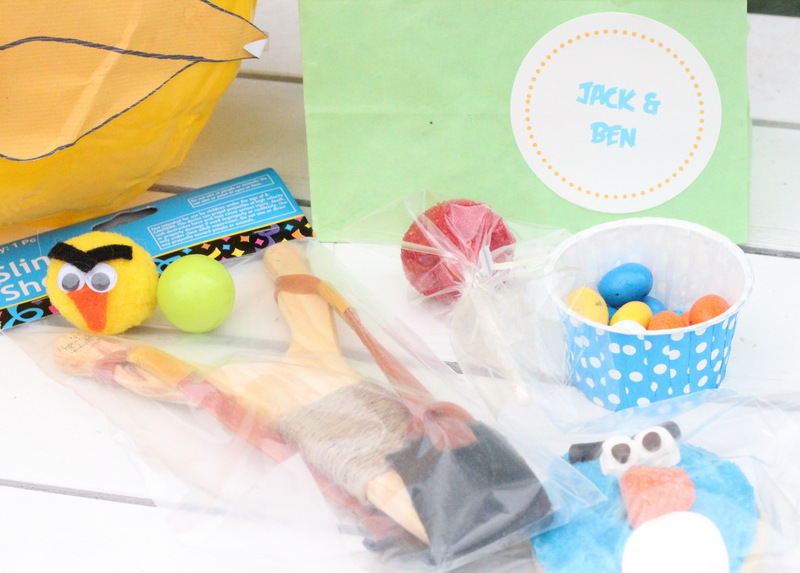 A slingshot (from Oriental Trading Company), an angry bird pom pom, some Angry Bird sweets, a bouncy ball and an Angry Bird beachball made the ride home just a little crazier, sugar high-er, more fun! The best part of the party, hands down, was afterwards when Burke shouted “Best. Birthday. Party. EVER!” (there might’ve been some fist pumping too- and what is cuter than a 4-year-old fist pump? Nothing, I tell you!). 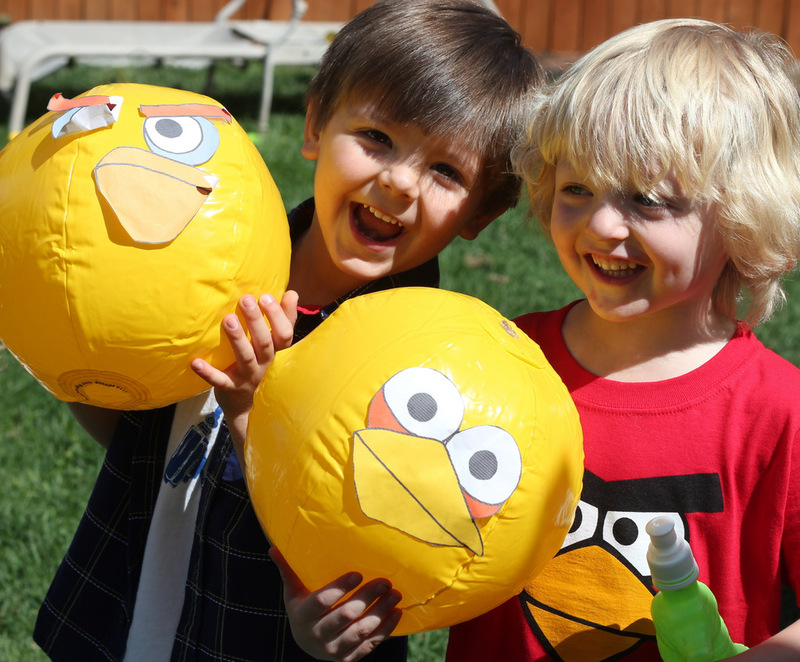 Happy birthday boy(s) + happy guests + tons of Angry Birds fun = Mission Accomplished. 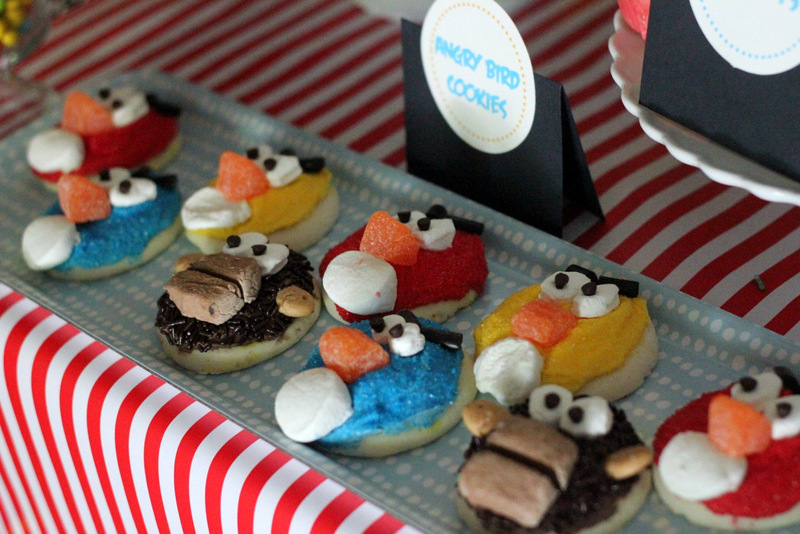 Are any of you (or your Smoochies or hubbies) Angry Birds fans? What a cute party! Stumbled onto your site this morning through another site while looking for cute teacher appreciation ideas (love your tea wreath!). Just wanted to say it was so great “bumping” into someone who understands my obsession with making everything on Powerpoint! Since my son was little (he’s 10 now), I’ve made invitations, thank you notes, cake decorations, cupcake toppers, parts for kid crafts, coloring pages, tags, favor bags — everything you can imagine for a kid’s b’day party. 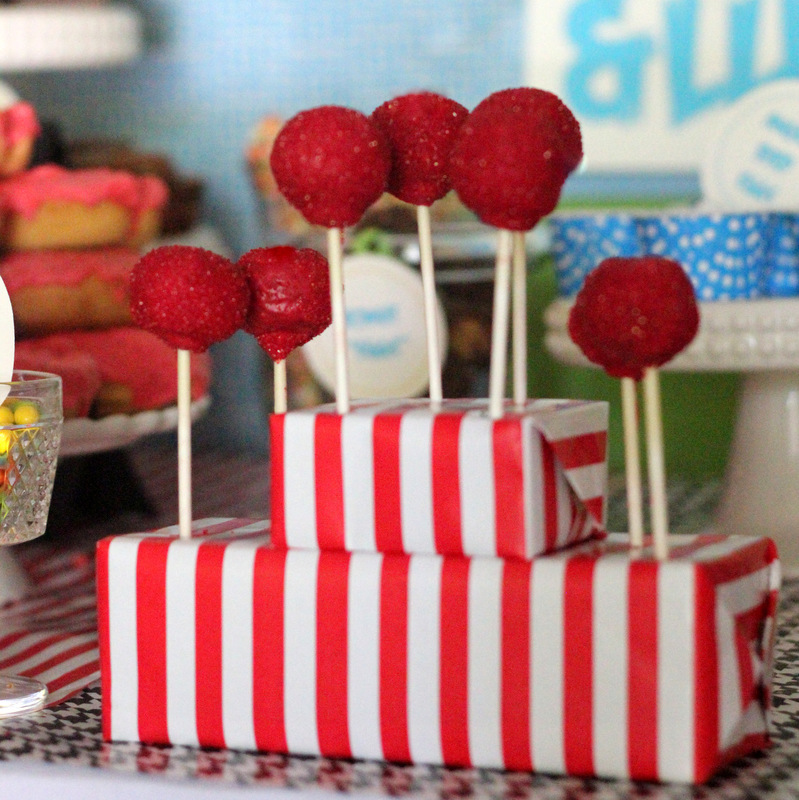 The cakes are always a big hit — I make an 8-1/2×11 design in Powerpoint (including the “Happy Birthday, _______! ), then take out a couple of the major parts of the picture (like the two largest fish on the fish cake) to be printed out separately. I have the bakery do a “photo” cake with the design. Cut out the parts that were printed separately and laminate back/front with clear packing tape. Glue a couple of new golf tees to the backs and insert into the cake where they were taken out of the design. Hope that makes sense! Good luck with your artistic endeavors! Brenda, I love it that you share my affinity for Powerpoint! I love the cake idea too! Awesome ideas! 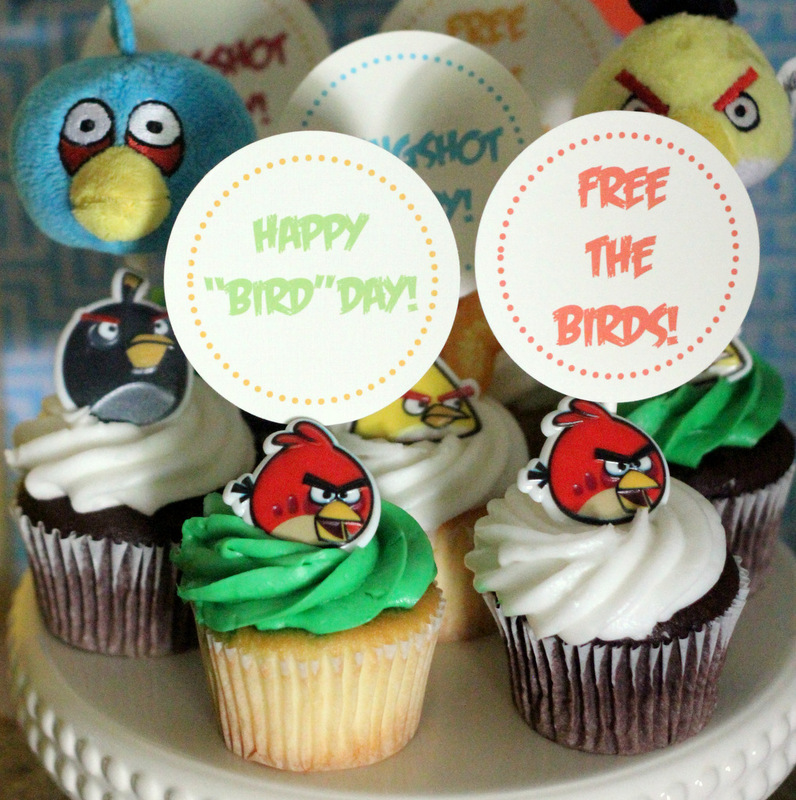 My oldest is thinking his 6th birthday should be Angry Birds. What a wonderful job. It looks like so much fun. I’m planing my little miss’s first birthday party. 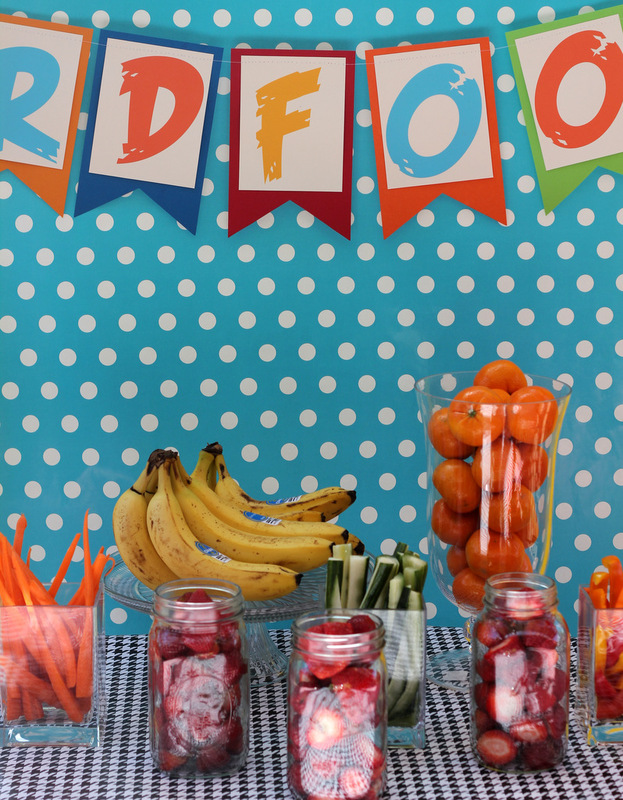 I like the idea of a large fuit and veggie section to balance out some of the sugary fun. Thanks for sharing! Love that Michaela- what is your theme??? And definitely to the fruit and veggies! Adorable! The colors are so bright and beautiful. going out to get a new sewing machine after school today to sew a rainbow themed something…my machine clunked out on me last week. cannot go with out that! Hats off! You thought of everything…sounds like so much fun. Thank you!!! It was a blast (an exhausting blast)! 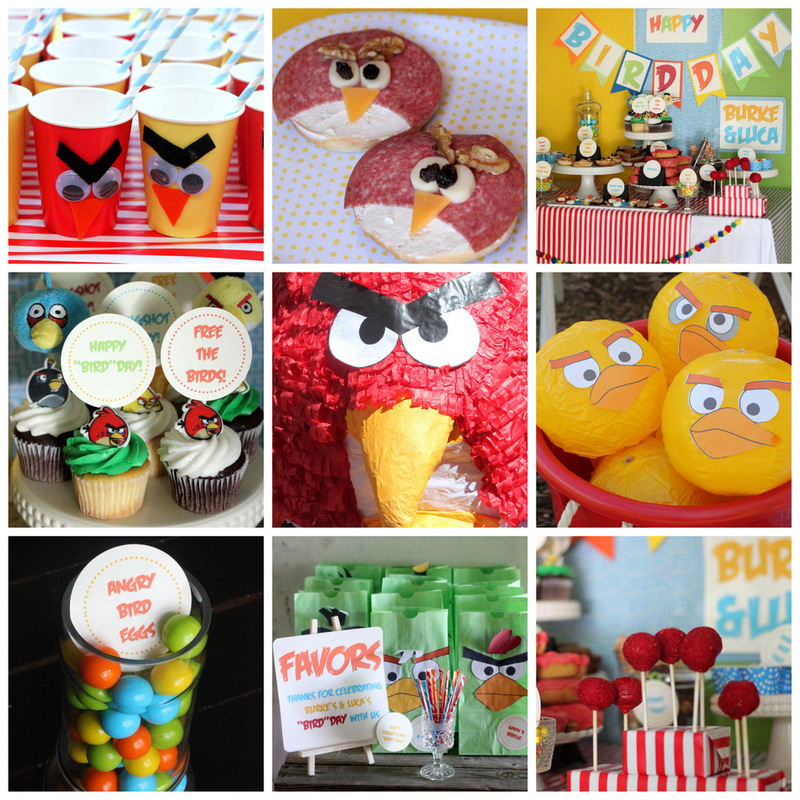 That is just about the most awesome Angry Birds party ever! Of course you rocked the details, and man I would LOVE to sample those syrups, they sound amazing!! yummmmm!! Fabulous party as usual Kristin!! How’s the cowgirl party coming (when is that one?)??? Or is Under the Sea first??? I like this kind of theme party!! Amazing!!! You make a GREAT Party!!! Great party!!! I love everything you did!! It is nice to see that I am not the only “party freak” (as I have been called) out there lol. 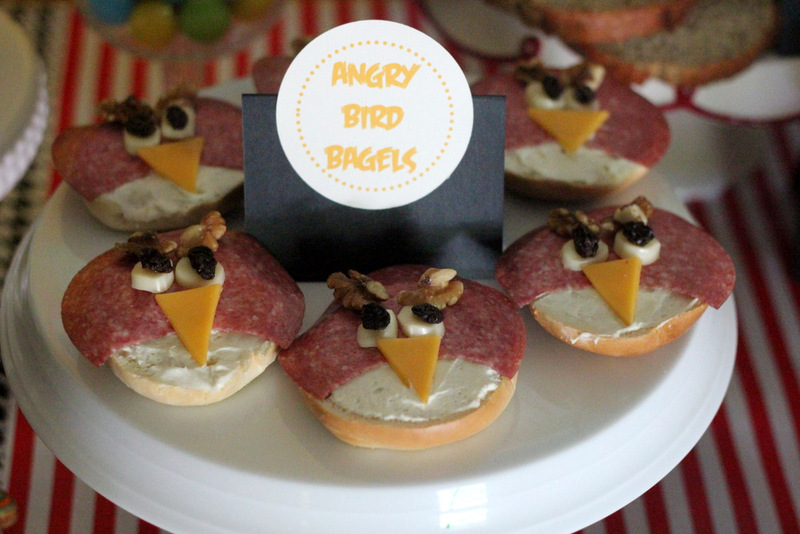 My 5 yr old wants an Angry birds party this year. Thanks to you I have some inspiration 🙂 What font did you use for the signs? Hey Michelle! 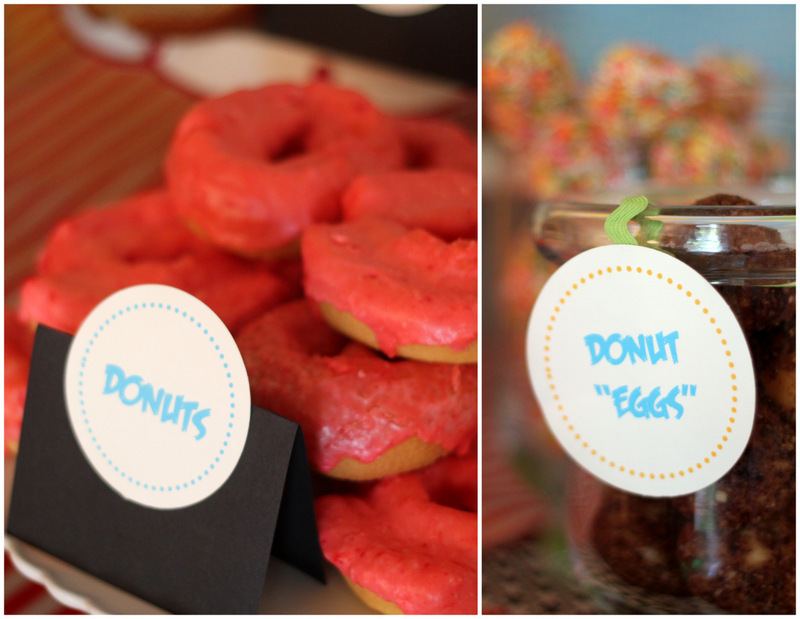 Parties are too fun to not go all out, right? Totally love this party!! Found on Pinterest. 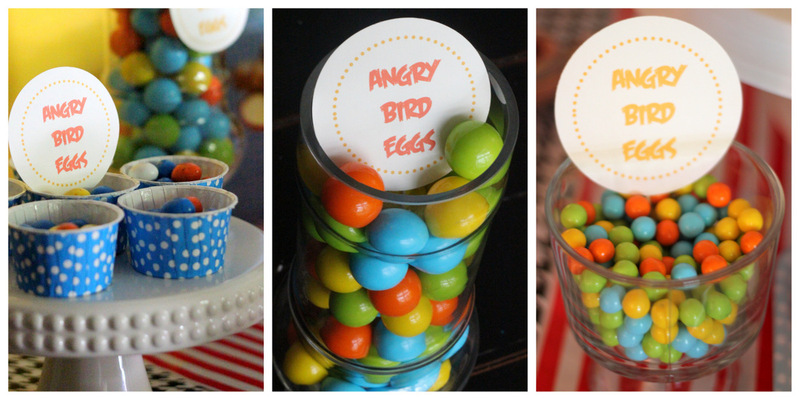 My going to be 12 year old wants an Angry Bird party this year and this is some seriously awesome inspiration! Plus my going to be 4 year old daughter want a rainbow party…so I’m thinking of trying to make some things do double duty (like pom pom garland). So inspiring!! Thanks! Not sure if I missed this in the descriptions above, but what font did you use on all of your signs? Hi! I love all of your ideas!! Is there anyway you could give me some detailed instructions on how to make the banners and labels on powerpoint?? I have tried but cannot figure it out, thanks sooo much!!! Hey Jennifer- we have a ‘behind the scenes party’ series starting later this month and ‘label making’ will be near the beginning (it won’t be a back-to-back series, it’ll be spaced out over a few months). Is your party before then? Kristin, it is actually this Sunday!!! The basics are finding a circle that matches your circle punch (with some trial and error I found ones that are the right size and now I just cut and paste for every new party). Then use the Word Art tool to add text (fontspace is my favorite spot for finding fun lettering). The “shapes” tool is also helpful (to add a block or a circle). The Angry Birds font is called Feast of Flesh. 🙂 Good luck! 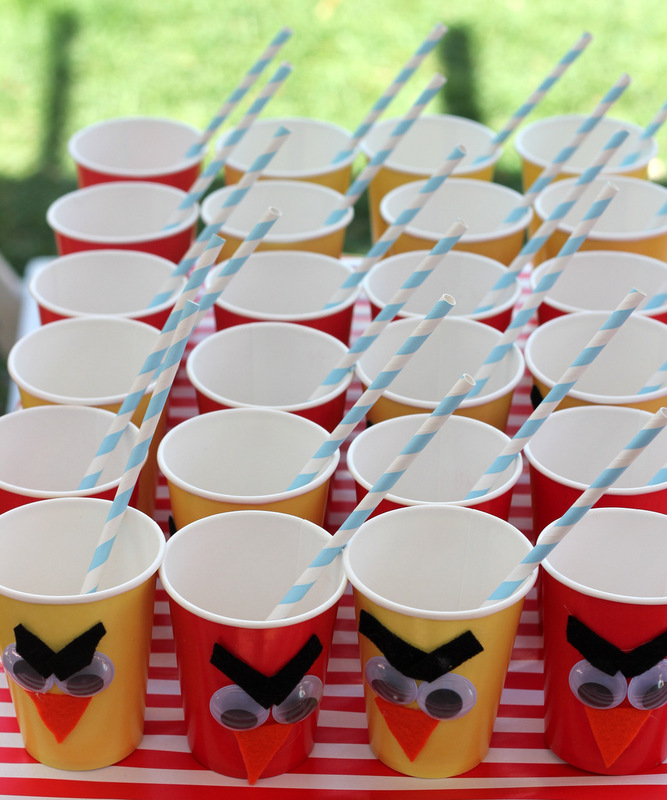 I loved looking at this party! Great job! One question- where did you find the piñata? Thanks for sharing all the great details! This party is great! Where did you find the table covers and back drops? The table cover/runner is striped IKEA wrapping paper and the backdrops are made out of the really wide crepe paper (you can get it at Costplus World Market, or online). 🙂 Hope that helps! 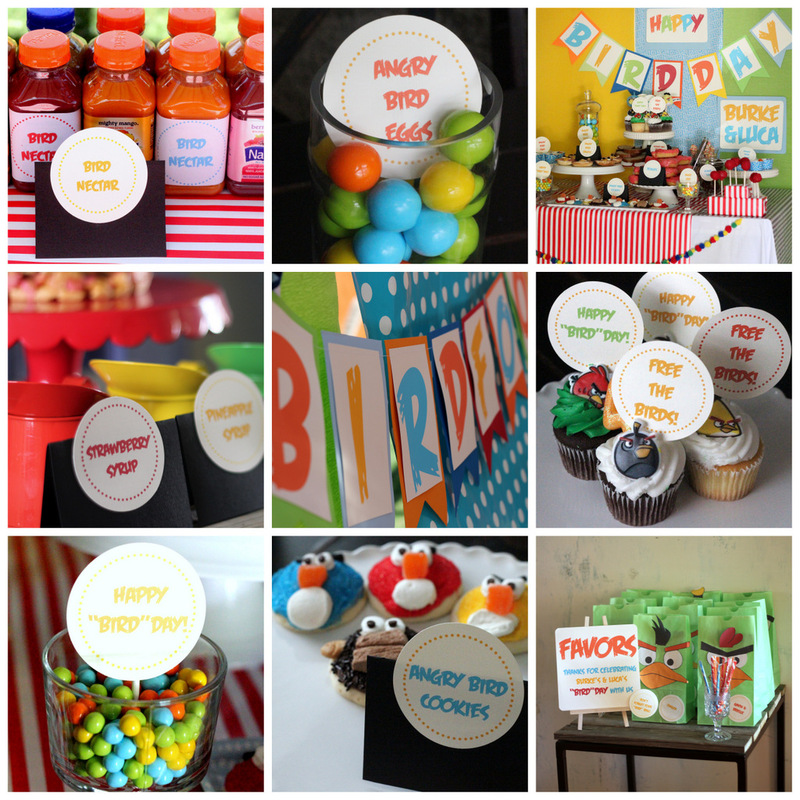 Fabulous party… Love all your ideas and the fact that you created things using PowerPoint! Can you tell me what colors you used for the Birthday banner? Hey Dawn, thank you! I don’t have those files any more (lost them in a computer crash). Sorry! 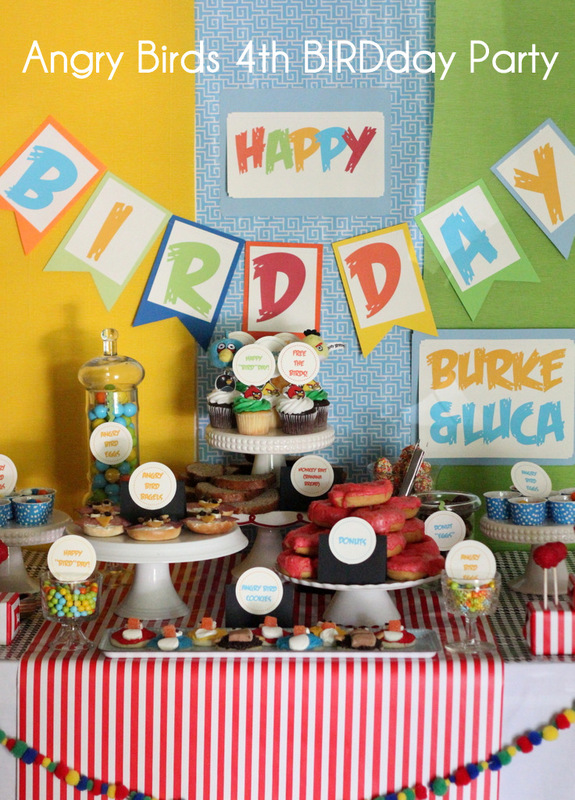 Hi, I just LOVE your ideas for your boys party!!! 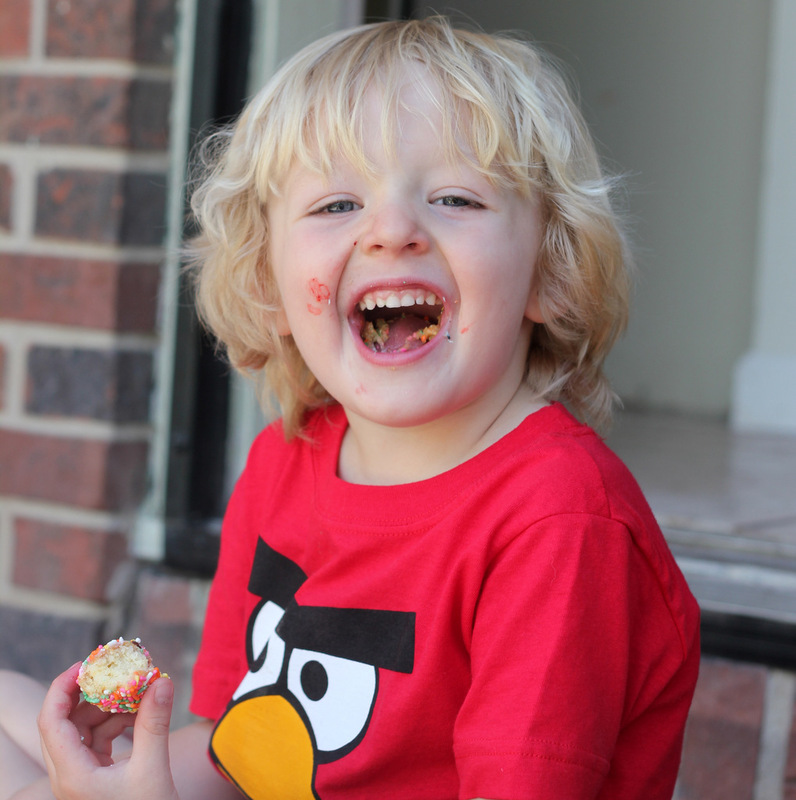 I´m from Germany and my boy would like his 5th year birthday to be an angry birds birthday. So I was looking for some little things to order, when I found your site by case! I´m not someone who likes to copy, as I´m normally the creative one, but I hope you don´t mind, if I´m taking over some of your lovely ideas for our party here. I just find them wonderful, funny and a real hit and I´m sure my son would love these litte details! What a sweet comment Claudia! Please copy away (it’s the sincerest form of flattery!). 🙂 I hope your son has a great party!